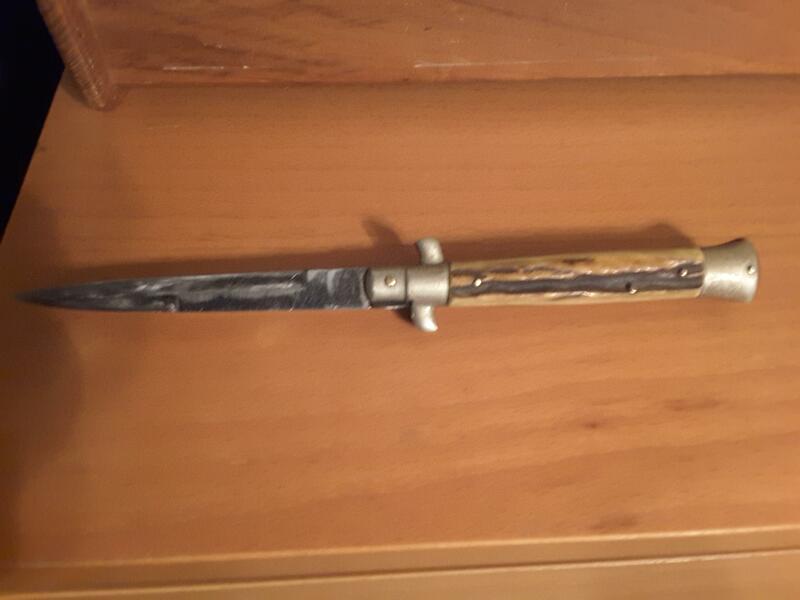 Hello I came across this knife at a yard sale and want to find out more about it. Maybe get a better idea of how old it is? I know it's a Coricama Picklock red dot probably from the 50's, is there a way to narrow down the date? 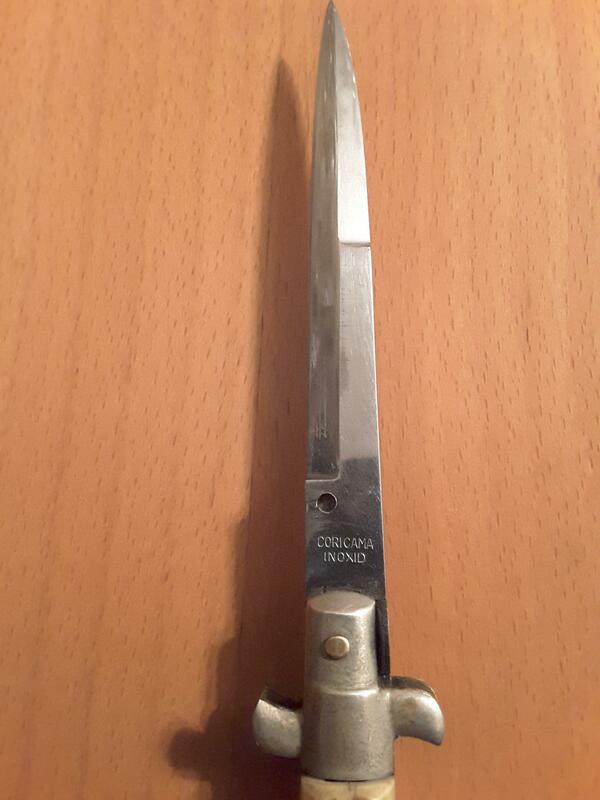 Also can anyone confirm what the handle is made from? It looks a lot like other examples I've seen of stag horn but it is a little lighter. Also would be interested in knowing the value if at all possible. That's a great knife. It is from the 50s; the exact date isn't really important. If you are just curious someone might have a more exact date. The scales are stag. They look like the originals. It could be worth a lot, well over $1000. But that blade sharpening is going to cut it's value down to about 1/3 of what it would be in mint condition. Yeah unfortunately that's the way I got it, in person the blade does not look that bad. It seems the camera picks up every minor scratch from the sharpening and accentuates it making it look worse than it truly is. The knife is a later one that probably came from South America. That seems to be where most of the stainless models were sold. Older models did not use a plated steel button, and usually had the safety dot inlaid with plastic, rather than painted. Probably early 1960s. If there is no blade loss, and just light scratches, that might not take so much off it's value but the difference between mint and almost mint is still a lot. It's TRULY a lovely knife, congrats on that find! Hmm... I read in another thread that the stag model never had the red dot inlay, it was always painted on. 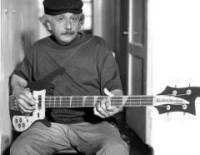 Can anyone else confirm this or debunk this? JulesVane wrote: It's TRULY a lovely knife, congrats on that find! Regardles, it's a newer knife. This one is very similar to yours. The red dot is painted. The stamp is different. The inox on this one is on the back side. I just love it - finding a Coricama at a yard sale!!! Hi sorry to jump on peoples posts like this but I haven’t a clue what I’m doing or how to Evan make my own post . 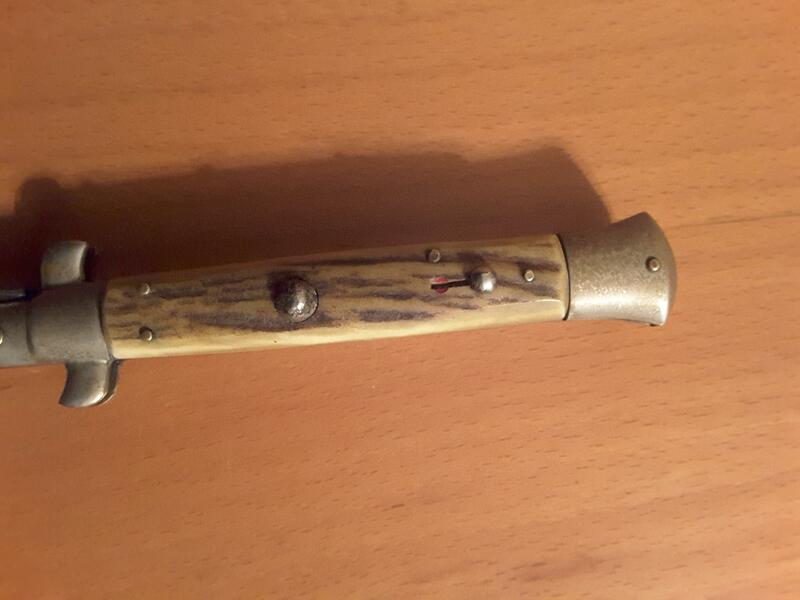 Basically I have come across what appears to be a very old automatic knife . 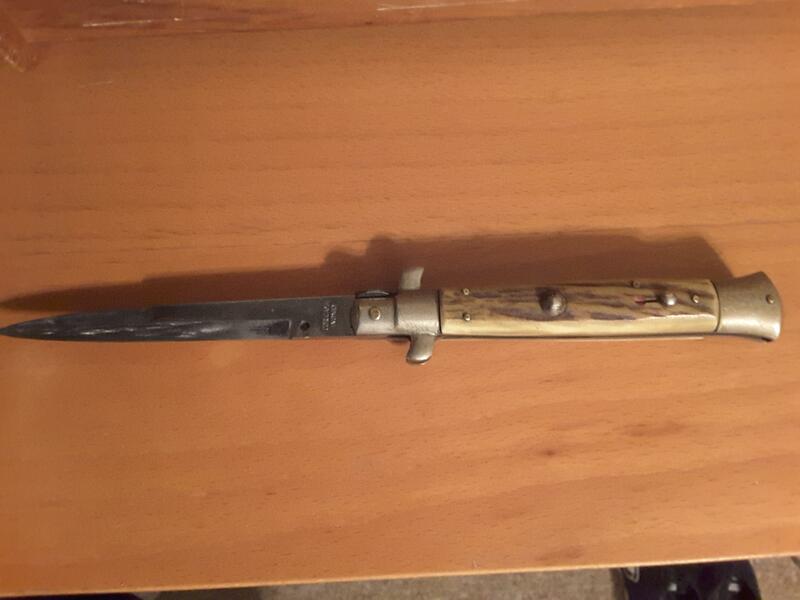 I have looked over it and can only find a couple of faint stamps / markings on it , one on the mettle end of the handle that looks like writing and 1 on the blade near where it attaches that looks some kids of arrow / angle / shuttlecock maybe and the handle is made of some sort of bone / horn of some sort . I have tried taking photos to upload however it keeps telling me the file is too big . Can anybody help !! Hi BigJohn. 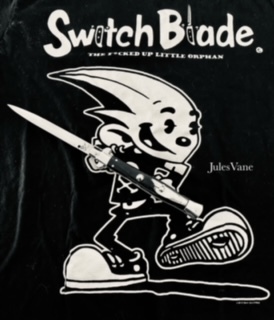 If you scroll to the top of this page and click on Switchblade Knives, it will bring you to the sections home page where you can click on New Topic. Enter the heading for your topic, then in the big box below (body), you can type the text of your interest/inquiry. To post pics, I use Imgur.com. Create a free account, add images, use the message boards/forums area, it will open your pics on your PC. You can then copy the link (green button) and paste it under your text in the body of your post. Imgur will insert the correct size pics for a forum. Repost these pics there and try for a better shot of any makers marks on the tang "where the blade meets the body" on your knife. Good luck and welcome!